The film begins in a sandstorm where travelers rest with their camels beneath a cliff. Here, Ajar the snake and Pitt the scorpion successfully steal a watermelon from one of the camel's baskets. After the storm, the two protagonists try to enjoy their melon, only to have it brutally taken from them by a larger bully purple Cobra (Saladin). Later the pals are traveling through the sandstone cliffs where snakes gather in the shade, only to be pelted by melon seeds by Saladin's friends. 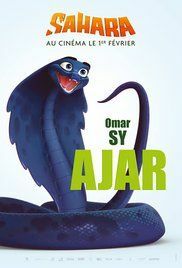 Ajar is teased for being young and small, as he hasn't shed to his adult skin yet. At the edge of the desert, Ajar proposes to fleeing to the Oasis, but Pitt points out that the Oasis belongs to the Green Snakes. There they happen to spot Eva, a Green Snake, trying to leave the Oasis, only to be caught by one of the Secretary Birds (Chief-Chief) which guard it. Pitt uses that as a reason to not go to the Oasis, but Ajar is not discouraged. Read more on Wikipedia.